Sat., Feb. 17, 2018, 8:54 p.m.
SEATTLE – Matisse Thybulle made sure that former Washington standout Isaiah Thomas wasn’t disappointed on his jersey retirement day. 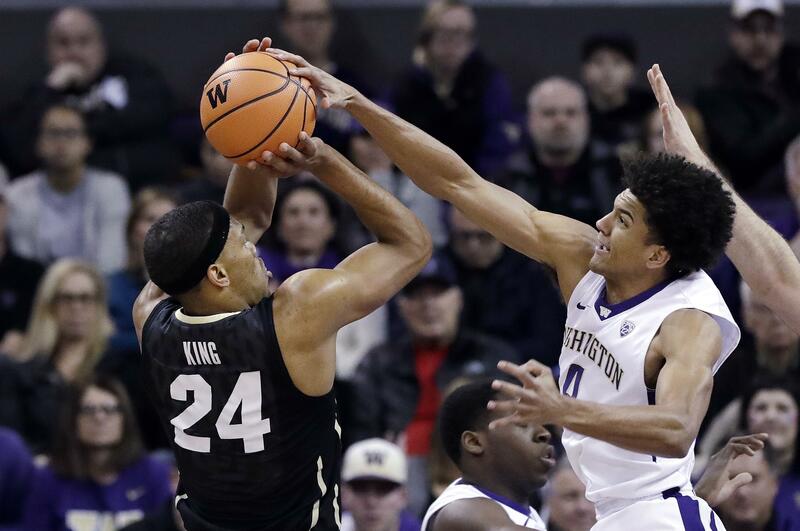 Thybulle scored 24 of his career-high 26 points in the second half and Noah Dickerson added 14 as Washington snapped a three-game losing skid by pulling away for an 82-59 victory over Colorado in a Pac-12 Conference game on Saturday night. Thomas, a two-time NBA all-star now with the Los Angeles Lakers, had his No. 2 jersey retired at halftime. Dominic Green, making his first start of the season, and Jaylen Nowell each added 11 points for the Huskies (18-9, 8-6). Tyler Bey scored 11 points and McKinley Wright IV had 10 for Colorado (15-12, 7-8). Washington forced 18 turnovers, converting them into 26 points. The Huskies also had a 17-2 advantage in fastbreak points. Washington, which let an eight-point halftime lead evaporate in a 70-58 home court loss to Utah on Thursday, maintained its second-half composure against the Buffaloes. The Huskies led 39-34 at the break and then outscored Colorado 21-6 to open the second half. Two free throws by Thybulle capped a 14-0 run and put Washington up 60-40 with 11:56 remaining. The Buffaloes pulled within 66-50, but Thybulle sandwiched a pair of 3-pointers around a steal and breakaway dunk to extend the advantage to 74-52 with 4:16 remaining. Thybulle, a 6-5 junior guard from nearby Issaquah, Washington, made 8 of 11 shots, including 4 of 5 from beyond the arc, and was 6 of 6 from the free-throw line. His previous career high was 20 against Yale last season. Thybulle also had four steals, pushing his Washington single-season record to 82 with four regular-season games remaining. Washington: The Huskies appeared headed toward an NCAA Tournament berth after consecutive home victories over ranked Arizona State and Arizona. Three consecutive losses that followed have them back on the bubble. They play at California and Stanford this coming week. Their final two regular-season games are at home against Oregon State and Oregon. The Huskies are 14-3 at home. Colorado: The Buffaloes had won three straight before a costly loss on Thursday at last-place Washington State. Next up are USC and UCLA at home, where Colorado is 11-2. The Buffs finish the regular season at Utah. Former Washington standout Isaiah Thomas, now a member of the Los Angeles Lakers, had his No. 2 jersey retired at halftime. Thomas becomes the third UW player to have his number retired, joining Bob Houbregs (No. 25) and Brandon Roy (No. 3). Former Washington players Markelle Fultz, the No. 1 overall pick in the NBA in 2017, and Marquese Criss, the No. 8 pick in 2016, were in attendance, as was former coach Lorenzo Romar. Published: Feb. 17, 2018, 8:54 p.m.